HISTORY Our family business was founded in 2002. We have become a staple in our community through hard work, perseverance followed by a strong commitment to our craft, and continue to provide professional garment care in the city of Murfreesboro Area. Our industry as well as the world in general has seen many changes since we opened our business. Our health and the preservation of the environment have been major topics throughout the world. This new age of awareness for our health and the health of our eco-system has been the driving force in initiating this change in our business. After years of research we were able to discover a healthier and effective alternative to “dry cleaning”. Traditional methods of dry cleaning use toxic chemicals which are harmful to our health and our environment. Wet cleaning is water based and non-toxic. Professional wet cleaning is environmentally friendly because no hazardous chemicals are released into our air, our water, or the clothing we wear. All detergents and conditioners used in the cleaning process are biodegradable. 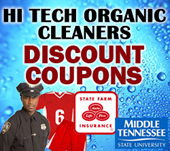 By endorsing Hi Tech Organic Cleaners you are supporting a business that is making positive changes for the preservation of our eco system as well as the health and benefit for the members in our community. As always our commitment and passion for cleaning clothes and delivering customer satisfaction remains our top priority. At Hi Tech Organic Wet Cleaners we lavish clothing with expertise and attention to detail. Your garments will be returned to you clean, pristine, and free of toxic chemicals. You will see, smell, and feel the difference. We are extremely proud of our new state of the art facility and encourage you to come and witness a demonstration. Something truly special is happening. At Hi Tech Organic Wet Cleaners your appearance is our business!